CVMR Corporation and Proteus Systems Inc. in a gathering of chemical industry professionals in Toronto, in anticipation of the Second World Congress on Automation and Robotics to be held in mid-June in Philadelphia, USA, and the International Conference on Design and Production Engineering in Berlin, Germany, in July, announced the success of their joint venture in providing a new generation of “control valve/flow sensor” in a “one unit fluid flow control system” used specifically for minerals processing market, from beneficiation of ores to slurry flow control. All process variables, such as pressure, temperature, and even particle concentration are measured at a single point in a fluid system with the ability to control flow rate or to shut off the flow completely. No leak to the environment without the use of dynamic seals. No accumulation of particles possible anywhere in the conduit. Smooth flow throughout the entire unit. Easy to clean the system. Energy efficient, offering significant savings in plant operations. Far less wiring required to and from the unit as compared to the existing technologies. Flow sensing can be accomplished via highly accurate venturi type or for “dirty” applications an ultrasonic device. The joint venture combines the global resources and expertise of CVMR in mining and refining, and Proteus Systems’ expertise in design of electro-magnetic devices. 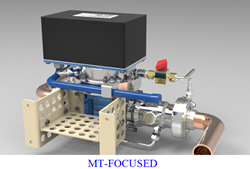 MT-FOCUSED flow control device will be marketed under the M-Power Corporation, an affiliate corporation to CVMR and a company that Proteus Systems has had a long and profitable close relationship in the field of renewable energy for over 16 years. Last year, the CVMR, Proteus joint team headed by Mrs. Paula Milinkovic, introduced a conveyor built used in transferring “reduced” nickel, iron and cobalt bearing ores from the a reduction kiln to a magnetic separator, made of a patented cermet compound material that can conduct a magnetic field efficiently and stand the heat and absorb the shocks that are natural factors in the beneficiation process. The material bends, can withstand temperatures as high as 3,000° Centigrade and can transfer a magnetic field faithfully. After reduction the ore is cooled and magnetically separated using this conveyor system. MT-FOCUSED complements this process perfectly, by eliminating blockage in the flow of slurries. CVMR® Corporation is a privately held, technology driven corporation engaged in refining of some 32 metals using proprietary processes and technologies that are completely neutral to the environment. It can neutralize arsenic, remove mercury and dispense with the use of cyanide in copper and gold mining; it can refine rare earth metals and PGMs without any acid residue. CVMR® uses low grade as well as high grade ores of various metals, whether in sulfide, limonite or saprolite form, and after concentrating them and refining them produces products that have very high value in the market and are mostly priced independently of the commodity markets – metal powders, nano-powders, net shapes and super alloys, metal powders specifically used in 3D printing for manufacture of car parts, computer parts, electronic parts, molds and tools, sophisticated net shapes for use in the defense and aerospace industries, battery manufacturing, medical instruments, pharmaceutical and food industry, etc. All produced without any pollution of the air, water or soil. M-Power Corporation (“M-Power”) is a full-service, power generating and distributing corporation specialized in implementing its proprietary technologies in the Emerging Economies that might not have sufficient funds or conventional resources to use as fuel for energy generation. Energy and energy related infrastructure development are the company’s key areas of focus and expertise. M-Power’s energy infrastructure development teams are multi-disciplinary with sub-sector experiences that include all aspects of power generation, transmission, distribution, trading, clean tech, climate change and emissions trading, including the MUSH-sector focused infrastructure, energy conservation, energy storage, retrieval, geothermal and waste to energy technologies. For more than 16 years, Proteus Systems Inc. a technology development company has been developing low-grade heat recovery and direct power conversion technologies in cooperation with M-Power Corp. (http://www.proteus-global.com). The management and expertise of both companies cross over seamlessly and have been doing so for over 15 years. Mr. and Mrs. Milinkovic, both with over 30 years of Professional Engineering work in Canada, US, and Germany have been closely affiliated with CVMR from its inception. The relationship between the heads of these two corporations goes as far back as 1996. “The synergy among Proteus Systems, CVMR and M-Power is proven to be highly productive. We have collectively been able to produce a seminal patent, on average, every three months or so. Our latest invention has far reaching positive ramifications in many fields of endeavor. We are quite certain of its success in the market place.” Said Mr. Miro Milinkovic, President of Proteus Systems.